They sit rather upright, like they are sitting to attention, alert and ready. Their eyes are large, and their short but broad bill has whiskers around the base to help catch the flying insects they feed on. These agile little birds take their prey on the wing, dashing out from a branch, snatching prey mid-air before returning to their perch. They are known as Flycatchers. In Britain we have two regular species, both of which are migrants, appearing in the spring, nesting through our summer and then heading south to Africa for winter. The Spotted Flycatcher, could be called the striated flycatcher, or the boring, dullish browney-grey flycatcher. At first sight they may appear just that, a little brownish grey bird with a few streaks. But look closer, and you see the large, dark eye, the pale white underparts with the subtle soft brown streaks. Its back and wings darker with delicate striations on the head. Then just sit and watch. They are wonderful to watch. Sitting patiently on a branch, telegraph wire, or edge of building… then darting out into the sky, almost hovering mid-air sometimes, or dashing around in pursuit of prey. Then back to sitting and watching, the picture of calm following the frenzy of activity. 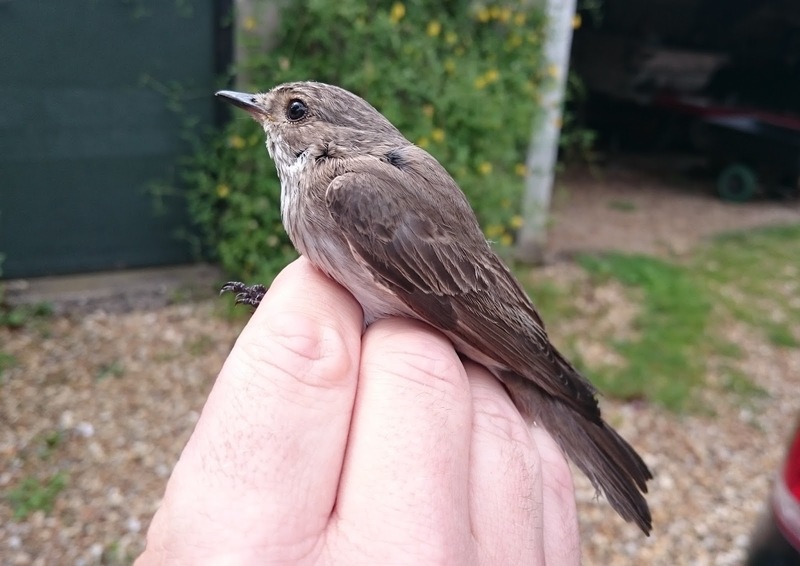 It was one Sunday afternoon in June that saw us sipping tea and eating kindly offered biscuits while watching a pair of Spotted Flycatchers busily feeding and coming to and fro from their nest on a ledge under the eaves of a barn. We had been invited to see if we could catch and ring the birds as part of the BTOs wider ringing scheme. Although just up the road from us, we do not get too many opportunities to ring adult Spotted Flycatchers and were only too happy to take up the offer. With the birds busy feeding chicks it was not too long before the one, and then the other were caught in our strategically placed net. The process was quick, we are old hands now, and it is not long before the birds are back catching insects and feeding their chicks. Just a little time though to admire the subtle beauty of these little birds. The other species is the Pied Flycatcher. Much more of a western UK bird, we do not see them much at home in the East of England. But travel west and we have often been found helping out with nest box monitoring projects for these charming little, black and white birds in the sloping woods of Wales. It is not however a bird one expects to catch when mist netting in your parents-in-laws garden. 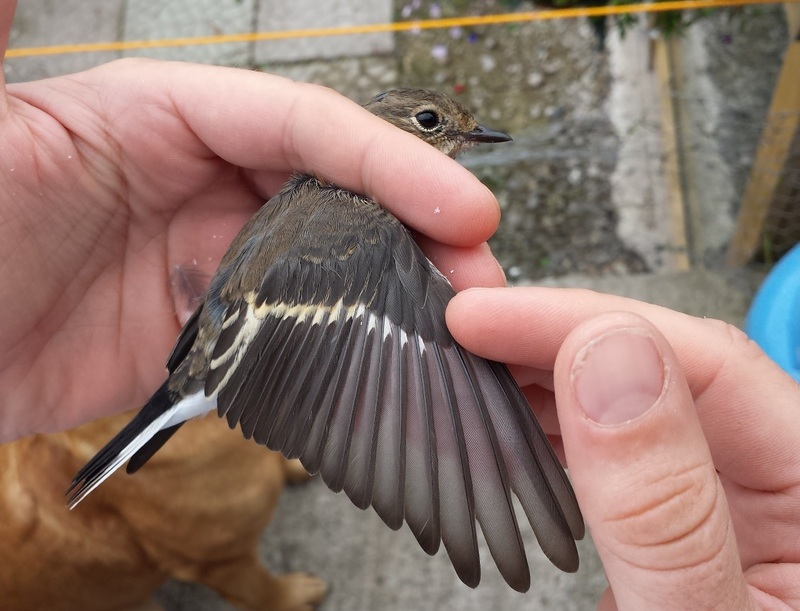 Namely because we are mostly catching birds that come into the seed and nut feeders to eat, and Pied Flycatchers like the Spotted ones prefer their food a little more wriggly, flying, and alive. So when Lee picked a rather dull brown bird out of the net it took us a moment to realise what it was! Females and young Pied Flycatchers tend to be browner than the striking black and white males. But there are still the Flycatcher features of short but broad bill, large eyes, and in this case the white patches on the wing and tail telling us it is a Pied. In fact it was a bird of the year, hatched probably only a few months before in one of the surrounding woodlands. But to see it, let alone catch it in the garden is quite something else! The unexpected Pied Flycatcher caught in the garden!